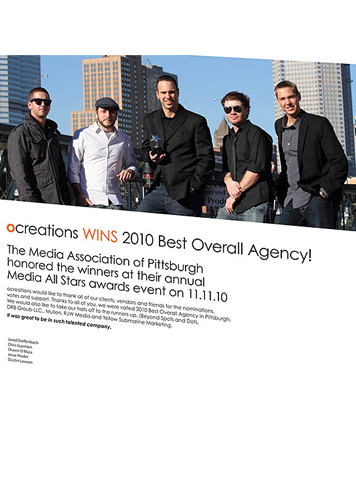 Newcomer ocreations was voted the 2010 Best Overall Agency in Pittsburgh and was presented with the award at the Media All Stars Awards Event on November 11, 2010. The Media All Stars Awards are sponsored by the Media Association of Pittsburgh (MAP). ocreations won the award after becoming one of the five finalists in the best overall agency category and received the most votes from individuals working in the media, design or marketing & communications industry.“Winning a Media All Stars Award is a great achievement, because it means that you’re not only doing a good job, you’re doing it in a professional and courteous way. 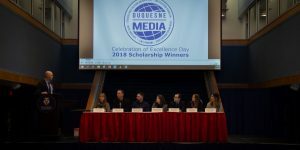 A way that makes you stand out in all of Pittsburgh media,” stated the Media Association of Pittsburgh website. This is the first year ocreations was nominated for any of the Media All Stars Awards. 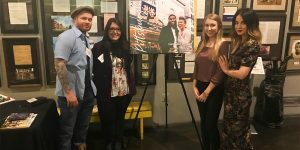 In addition to winning the Best Overall Agency, they were also nominated for Best Media Buying/Planning Department and partners Shawn O’Mara and Jesse Mader were nominated for Best Media Buyer/Planner and Best Assistant, respectively.